This pass gets your day in Versailles started on a royal foot with a delightful Gourmet Breakfast Experience inside the palace itself at the exceptional Ore restaurant by Alain Ducasse. Soak up the morning light in a timeless setting while enjoying a breakfast fit for kings. On the menu: savoury mini pastries, 2 organic eggs scrambled or pan-seared, sausages with tomato, a seasonal fruit salad, hot drinks, fruit & vegetable juices, toast. No better way to get your day started before beginning your audio guided visit of the residence of the Sun King himself, the Palace of Versailles. - You will need to come and collect your Pass that contains the tickets for all your chosen activities. 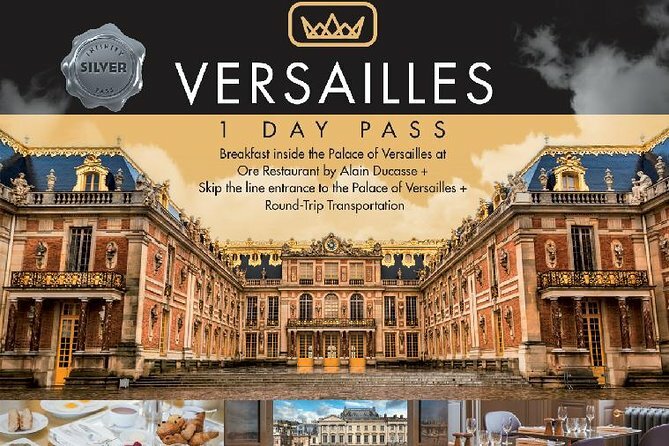 This pass gets your day in Versailles started on a royal foot with a delightful breakfast inside the palace itself at the exceptional Ore restaurant by Alain Ducasse. Soak up the morning light in a timeless setting while enjoying a breakfast fit for kings. On the menu: savoury mini pastries, 2 organic eggs scrambled or pan-seared, sausages with tomato, a seasonal fruit salad, hot drinks, fruit & vegetable juices, toast. No better way to get your day started before beginning your audio guided visit of the residence of the Sun King himself, the Palace of Versailles. You really get “the sun king” experience entering the palace and getting to eat a delicious breakfast in an exclusive dining area. The wait staff were very friendly and it is totally worth skipping the lonngggg and I mean LONG admission line after eating. However, after touring the palace, we were told we couldn’t access the grounds at all because there were musical fountains happening that day. Our ticket clearly indicated that we had access to the grounds but we were not permitted unless we purchased additional tickets which we decided not to. I was really upset about it because Versailles isn’t really a treat until you’ve seen the expansive grounds. So beware of that when booking your excursion! !